Second hand transactions above £1m in London have fallen by about -15% since a peak in 2014. At this time, new build sales above £1m accounted for just 10% of the market. Fast forward to 2018 and during the 12 months to April this year new build sales accounted for 18% of sales in this part of the market.1 Since 2014, the higher Stamp Duty Land Tax (SDLT) liability for properties over £1m has deterred home movers meaning the availability of quality second hand stock in this part of the market has been constrained. So why are we seeing a move towards new build? It is in part a function of more new build stock being available to buy –we’ve seen over 18,500 prime new build completions since 2014. But other drivers have also played a part. There has been a flight to quality amongst buyers and the associated amenity provision that comes with prime new build property, coupled with lack of quality second hand stock, has driven demand. Pragmatic developers are increasingly willing to offer sales incentives and price realistically. Additionally, the currency advantage has been a major driver for international buyers since the 2016 EU Referendum vote2. 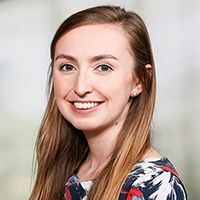 The recent strengthening of GBP this year could be the sign that the currency window is closing, but we also know that the motivations of overseas buyers are not solely exchange rate driven. 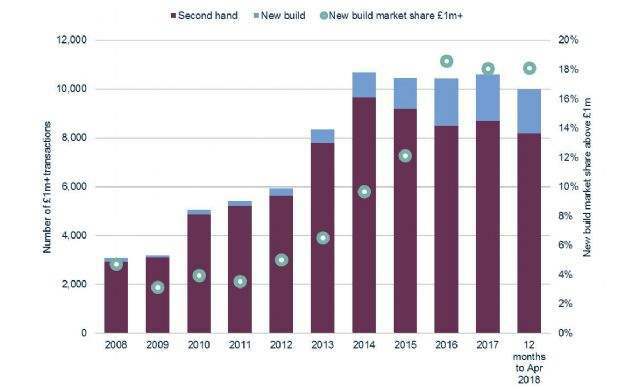 The increase in London’s prime (over £1,000psf) supply pipeline remains unprecedented owing to an exceptional number of construction starts between 2014 and 2016. During this time many tower schemes, which cannot be phased, began construction meaning that nearly two units were started for every one sold. As these construction starts translate into completions, we expect an average of 8,500 prime residential units to reach practical completion over each of the next two years. This is 40% more than the number completed in 2017 and nearly 2.5 times more than the 2013-2017 5-year annual average. However, with a dramatic fall in prime construction starts during the year to H1 2018 (down 47% on the same period last year), we expect London’s prime completions pipeline to fall back in line with starts and sales from 2021 onwards, after a peak in 2020. Over this same period, we expect the starts to sales ratio to remain at a more sustainable 0.9 starts for every sale as the market rebalances. With 23,000 prime units currently being built (about a third of all of London’s private units under construction) the sheer scale and complexity of construction activity across London means there is less resource available. 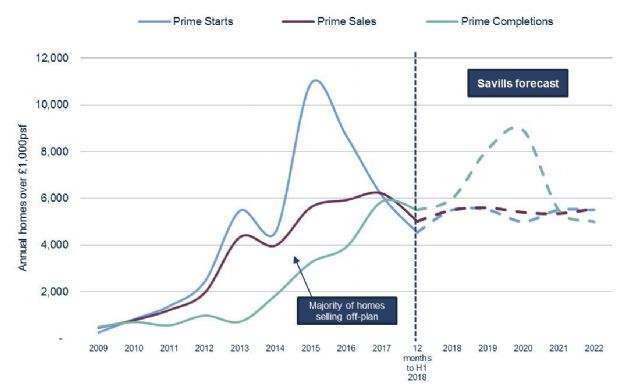 As a result, the average build period on prime schemes has increased from an average of 2.1 years between 2012-2016 to 3.5 years during the 12 months to H1 2018. This average increases to 4.5 years for large tower schemes that commenced construction in 2015. 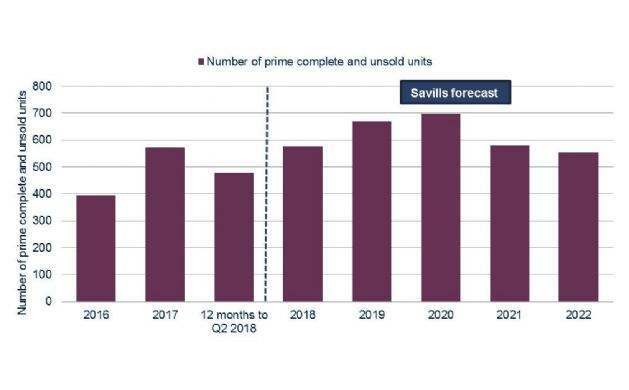 We forecast prime sales rates to remain broadly stable at around 5,500 per year between now and 2022, but as practical completions increase over the next 5 years, we will start to see an increase in complete and unsold units (or ‘stock units’) on the market. By 2020 the level of prime stock units on the market will reach an unprecedented high of nearly 700 units, 46% more than the number of prime stock units currently on the market. Whilst the number of stock units is set to increase, encouragingly for the prime market, the nature of buyers has been changing considerably over recent years with more purchasers choosing to buy closer to or at practical completion. In 2015, on average, prime buyers would typically purchase 31 months off-plan. During the 12 months to H1 2018, the average length of time prime new build buyers were purchasing off-plan was just over 15 months. Owner occupiers tend to feature more heavily closer to practical completion. In previous years, buy-to-let investors have been an important source of demand for the new build market. These buyers are often prepared to purchase off-plan, enabling developers to unlock the development finance required to commence construction. 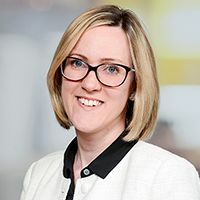 However, investors, particularly those with mortgages in the UK, are facing more stringent mortgage regulation and taxation changes. In a less certain economic and political climate and with a high supply of new build schemes, buyers are slower to commit to purchases and are taking their time to view all product on offer. As such, schemes that have the ability to differentiate themselves from the competition and that invest significantly in the marketing experience and sales process for the buyer will tend to do well. Hence, we are forecasting for sales volumes to remain stable over the next five years.